Since 1972, Wick & Trautwein, LLC has helped individuals and businesses resolve challenging legal problems. We provide personalized solutions designed to meet our clients' individual needs and to resolve each matter in the most positive manner possible. 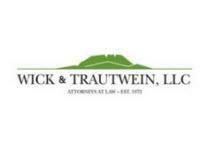 Wick & Trautwein, LLC provides advice, services and representation in a wide range of legal areas. Our firm helps entrepreneurs start corporations, partnerships and LLCs. We draft and review all types of contracts for individuals and existing companies. Our lawyers provide comprehensive services to people who want to purchase or sell a business. When a business, real estate or construction dispute arises, we resolve it through negotiation, mediation or litigation. Wick & Trautwein, LLC also provides legal services to individuals in areas of estate planning, elder law, employment law and family law. One of the advantages of Wick & Trautwein, LLC having a number of attorneys with a broad base of knowledge is that it allows us to work for you on a team basis. We are able to draw upon the experience and knowledge of the entire group, some of whom have more than 30 years of experience in their respective fields, when addressing the many facets of a client's complex problem. This depth and breadth of experience enables us to quickly identify the key issues in any legal matter and prescribe the course of action best-suited for achieving a successful outcome. In addition to our attorneys, we also have a dedicated and professional staff to assist us - and you - in working toward the best possible outcome. When needed, we can also team up with other outside professionals who can support the legal effort. At Wick & Trautwein, LLC, we always focus on the needs of our client. We tailor our approach to meet those particular needs and work diligently from start to finish to achieve the client's goals. Whether it involves business law, real estate law, or another matter, you will have the confidence of knowing that an experienced legal team is working hard to resolve your individual problem in the most positive way possible. I recommend Kathryn Lonowski based upon my own experience in my very long and somewhat complicated divorce. Kathryn is very intelligent and judicious; I feel Kathryn explored every angle on my behalf and made thoughtful decisions about what was reasonable, what was likely to work and what wasn't. Kathryn consulted experts when she felt that it would be beneficial to my case. The expense of divorce is a grim fact--no way around that--however, I did feel that the fees that I incurred were the result of necessary hard work by Kathryn and her team. If it could be said that there is a "winner" in divorce, I feel that Kathryn was able to secure this title for me in my case through her willful intellect and approach, and perseverance. While Kathryn is kind, congenial and gracious, her legal acumen and focus on winning your case is her strong suit. I recommend Wick and Trautwein, and Kathryn Lonowski.